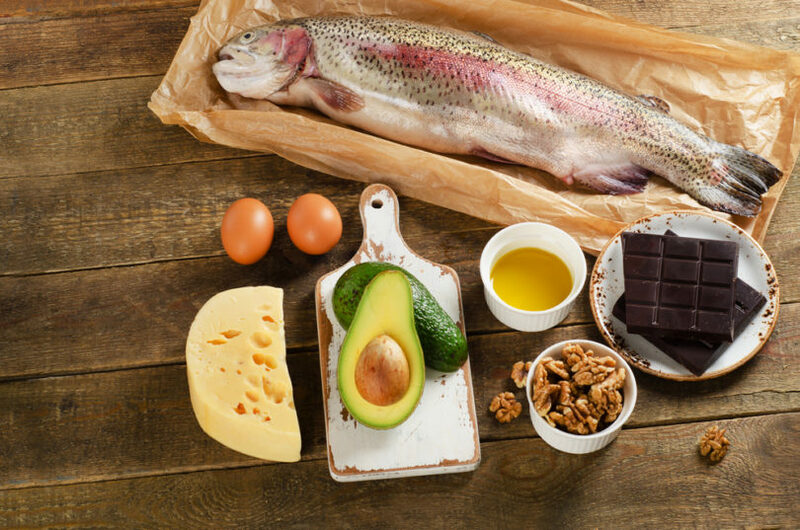 The ketogenic diet (or keto diet) is basically a very low-carbohydrate, adequate/low-protein, high-fat diet. It forces the body to burn fats rather than carbohydrates. This diet is used (since 1920) in medicine to treat epilepsy and can, in some cases, completely remove the need for medication [1,2,3]. Since 1960 this diet has become one of the most widely used methods for obesity treatment . Unlike other tissues, the brain requires glucose. Glucose is derived from carbohydrates except in extreme conditions where carbohydrates are used up, the liver starts converting fat into fatty acids and ketone bodies. These ketone bodies than travel to the brain and the heart where they replace glucose as an energy source. So, basically, the idea of a keto diet is to put your body into a process called ketosis where you no longer burn carbohydrates as a fuel but instead turn to the burning of ketones (beta-hydroxybutyrate (BHB), acetoacetate and acetone). The ketogenic diet is very popular among those trying to maintain a steady blood sugar levels and lose body fat. Typical ketogenic diet has a 4:1 ratio of a weight of fat to the combined weight of carbohydrate and protein. However, for epileptic children, these diets are individually tailored to their needs. Pic. 1 – Ketogenic meal. The first randomized, controlled trial evaluating the efficacy of low-carbohydrate diet for weight loss was conducted in 2003 by Foster and colleagues . They randomly assigned 63 obese man and women to either a low-carbohydrate, high-protein, high-fat diet or a low-calorie, high-carbohydrate, low-fat diet. The results indicated a greater weight loss after six months with high-fat diet compared to conventional diet but that the differences were not significant at one year. There was no significant relationship between weight loss and ketosis at any time during the study. Linda Stern and associates  reported no significant difference in overall weight loss between subjects on a low-carbohydrate diet compared to conventional diet after 1 year. Same was reported by Astrup et al. . However, subjects on the low-carbohydrate diet had more favourable overall outcomes (atherogenic dyslipidemia and glycemic control) . In contrast to findings by Foster et al. , subjects on the low-carbohydrate diet maintained most of their initial weight loss, whereas those on the conventional diet continued to lose weight . A systematic review by Dena M. Bravata et al. , which included studies published between January 1, 1966, and February 15, 2003, concluded that there is insufficient evidence to make recommendations for or against the use of low-carbohydrate diets. Researchers also noted that weight loss was not associated with reduced carbohydrate intake but with restriction of calorie intake . The same was concluded in a study published on March 2013 by Xin Liu et al. .
A study in high-level artistic gymnasts reported that ketogenic diet reduces body fat in a very short period of time without negative effects on strength performance . One very recent (2013) systematic review and meta-analysis  concluded that low-carbohydrate diets are likely unsafe and that calorie restriction has been demonstrated to be effective in weight loss regardless of nutritional composition. Low-carbohydrate diets tend to result in reduced intake of fibre and fruits, and increased intake of cholesterol and saturated fat, [8,9] all of which are risk factors for mortality and cardiovascular disease . When vegetable sources of fat and protein are chosen, the risk of coronary heart disease may be moderately reduced . Most short-term (from 10 days to 6 months) studies [12-16,25] have reported that people lost more weight on very-low-carbohydrate diets than on diets that contained the same number of calories but more carbohydrates. It was suspected that greater weight loss was from water . However, a few other mechanisms are suggested: altered metabolic rate by preserving more lean body mass, loss of energy in the form of ketones in urine, faeces, and sweat, it is even suggested that nutrients tend to move away from fat storage and toward the accumulation of lean tissue . However, as mentioned before, long-term studies show no significant weight loss when compared to conventional (low-fat, caloric restricted) diet [5,18,19]. This weight loss on LCHF is most dramatic after 3 and 6 months, there being no difference after 12 months between a conventional low-fat diet and the low-carbohydrate diet . A rapid initial weight loss may be due to low glycogen stores, leading to excretion of bound water . A systematic review of low-carbohydrate diets found that the weight loss achieved is associated with the duration of the diet and restriction of energy intake, but not with restriction of carbohydrates . It is suggested that LDL cholesterol measurement is monitored as it tends to increase after long-term ketogenic diet . It is commonly proposed that ketones suppress appetite [36, 37]. It has also been observed that subjects who were on ad libitum ketogenic diet tended to naturally restrict their energy intake [36, 38]. Ketogenic diet might suppress appetite due to its naturally high-protein content (most satiating macronutrient), ketogenic nature of the diet with satiety signals for fat being active, and absence of hunger-promoting carbohydrate components like sucrose and/or fructose . It has been also reported that ketotic subjects had reduced hormone ghrelin (a.k.a. hunger hormone, lenomorelin) and subjective appetite . On the other hand, it has been shown that carbohydrates and fat deliver the same amount of satiety per calorie when caloric density is matched . There is no doubt that ketogenic (very low-carbohydrate) diet promotes weight loss as there is strong supportive evidence about its effectiveness. It is also considered to be the most effective diet (even more than low-fat diet) for weight management and many studies support this. However, the evidence in the literature are not in concordance about its absolute effectiveness and even some doubt arose about its safety. Can Ketogenic Diet Really Starve Cancer? More and more evidence is suggesting that by systematically reducing the amount carbohydrate one could suppress or at least delay, the occurrence of cancer [20,21]. Malignant cells depend on steady glucose availability as they are not able to metabolize significant amounts of fatty acids or ketone bodies due to mitochondrial dysfunction . It seems that ketogenic diet may starve cancer cells since they heavily rely on glucose from ingested carbohydrates for their energy demands and biomass generation . Another mechanism suggested by Fine et al. is the inhibition of insulin caused by the ketogenic diet which could possibly be effective treatment for patients with cancer. The evidence is still preliminary and you should consult with your doctor before using ketogenic diet for cancer therapy. Ketogenic diets show promise as an aid in at least some kind of cancer therapy and it deserves further and deeper investigation. The influence of nutrition on skin health is a growing research area but the findings of various studies are often contradictory. Researchers are still equivocal about whether a diet is or is not a key factor for acne development . Recently there has been an increasing number of studies published, suggesting a nutritional influence on the development of acne. Diets high in glycemic load have recently been implicated to cause acne due to their ability to affect insulin secretion, androgen bioavailability and insulin-like growth factor-I activity . It is not yet conclusive, but clinical and physiological evidence suggests ketogenic diet could be effective in reducing the severity and progression of acne . Further randomized clinical trials are warranted to resolve the issue. BHB (a major ketone) has been reported to be even more efficient fuel than glucose, providing more energy per unit oxygen used . A ketogenic diet also increases the number of mitochondria in brain cells leading to enhanced alternative energy stores . A study by Noh et. al. found enhanced expression of genes encoding for mitochondrial enzymes and energy metabolism in the hippocampus, a part of the brain important for learning and memory. A study by Brinkworth et al. reported that over the course of 1 year there were more favourable effects on an energy-restricted low-fat diet compared to low-carb diet on mood state while both low-carb and low-fat diets had similar effects on working memory and speed of processing. There have been some reports and concerns about hair loss and thinning while on the ketogenic diet. Some evidence can also be found in the literature. 2 out of 45 patients, aged 12–19 years, reported thinning of hair and/or hair loss, while on a ketogenic diet program from 1994 to 2002. In both cases, hair loss was corrected with vitamin supplementation . Reported hair loss may be due to many other reasons, for example, starvation , which is often the case with extreme diets as severe caloric restriction with chronic starvation can also induce hair loss. Dramatic changes in diet (which KD definitely is) is a stress for our bodies which may temporarily increase the rate at which your hair sheds as your body adjusts to fat burning mode. Studies that examined blood lipid responses indicate that very-low-carbohydrate diets generally result in small increases in total cholesterol (moderate increases in low-density lipoprotein [LDL] and high-density lipoprotein [HDL]), which can be reversed if significant weight loss occurs . There is also a concern that diet low in carbohydrates and high in saturated fats might lead to insulin resistance, however, recent studies showed that very-low-carbohydrate diets do not have an adverse effect on glucose metabolism or insulin resistance . Side effects of the ketogenic diet may include calcium oxylate and urate kidney stones, vomiting, amenorrhea, hypercholesterolemia, water-soluble vitamin deficiencies , acidosis, hypoglycemia, gastrointestinal distress, dehydration, and lethargy . A higher risk of skeletal fractures in children on the ketogenic diet has been reported . On the other hand, long-term study by Bertoli et al. reported that maintaining a ketogenic diet for more than 5 years does not pose any major negative effects on body composition, bone mineral content, and bone mineral density in adults. The long-term effects of the low-carbohydrate diets on blood lipid profile give a mixed picture of positive and negative changes . However, most systematic reviews show no significant adverse effect on serum lipid, fasting serum glucose, and fasting serum insulin levels, or blood pressure [6,26]. However, one systematic review of observational studies concluded that low-carbohydrate diets were associated with a significantly higher risk of all-cause mortality . Freeman, John M., et al. “The efficacy of the ketogenic diet—1998: a prospective evaluation of intervention in 150 children.” Pediatrics 102.6 (1998): 1358-1363. Vining, Eileen PG, et al. “A multicenter study of the efficacy of the ketogenic diet.” Archives of neurology 55.11 (1998): 1433. Paoli, A., et al. “Beyond weight loss: a review of the therapeutic uses of very-low-carbohydrate (ketogenic) diets.” European journal of clinical nutrition (2013). Foster, Gary D., et al. “A randomized trial of a low-carbohydrate diet for obesity.” New England Journal of Medicine 348.21 (2003): 2082-2090. Stern, Linda, et al. “The effects of low-carbohydrate versus conventional weight loss diets in severely obese adults: one-year follow-up of a randomized trial.” Annals of internal medicine 140.10 (2004): 778-785. Bravata, Dena M., et al. “Efficacy and safety of low-carbohydrate diets.” JAMA: the journal of the American Medical Association 289.14 (2003): 1837-1850. Noto, Hiroshi, et al. “Low-Carbohydrate Diets and All-Cause Mortality: A Systematic Review and Meta-Analysis of Observational Studies.” PloS one 8.1 (2013): e55030. Fung TT, et al. “Dietary patterns and the risk of coronary heart disease in women. ” Arch Intern Med 161 (2001): 1857–1862. Halton TL, et al. “Low-carbohydrate-diet score and the risk of coronary heart disease in women.” N Engl J Med 355 (2006): 1991–2002. Floegel, Anna, and Tobias Pischon. “Low carbohydrate-high protein diets.” BMJ: British Medical Journal 344 (2012). Liu, Xin, et al. “Effects of a low-carbohydrate diet on weight loss and cardiometabolic profile in Chinese women: a randomised controlled feeding trial.” The British journal of nutrition (2013): 1-10. Rabast, U., K. H. Vornberger, and M. Ehl. “Loss of weight, sodium and water in obese persons consuming a high-or low-carbohydrate diet.” Annals of Nutrition and Metabolism 25.6 (1981): 341-349. Rabast, U., J. Schönborn, and H. Kasper. “Dietetic treatment of obesity with low and high-carbohydrate diets: comparative studies and clinical results.” International journal of obesity 3.3 (1978): 201-211. Brehm, Bonnie J., et al. “A randomized trial comparing a very low carbohydrate diet and a calorie-restricted low fat diet on body weight and cardiovascular risk factors in healthy women.” Journal of Clinical Endocrinology & Metabolism 88.4 (2003): 1617-1623. Samaha, Frederick F., et al. “A low-carbohydrate as compared with a low-fat diet in severe obesity.” New England Journal of Medicine 348.21 (2003): 2074-2081. Yancy, William S., et al. “A low-carbohydrate, ketogenic diet versus a low-fat diet to treat obesity and hyperlipidemiaA randomized, controlled trial.” Annals of internal medicine 140.10 (2004): 769-777. Volek, Jeff S., and Eric C. Westman. “Very-low-carbohydrate weight-loss diets revisited.” Cleveland Clinic journal of medicine 69.11 (2002): 849-849. Wycherley, Thomas Philip, et al. “Long‐term effects of weight loss with a very low carbohydrate and low fat diet on vascular function in overweight and obese patients.” Journal of internal medicine 267.5 (2010): 452-461. Brinkworth, Grant D., et al. “Long-term effects of a very-low-carbohydrate weight loss diet compared with an isocaloric low-fat diet after 12 mo.” The American journal of clinical nutrition 90.1 (2009): 23-32. LaGory, Edward L., and Amato J. Giaccia. “A low-carb diet kills tumor cells with a mutant p53 tumor suppressor gene: The Atkins diet suppresses tumor growth.” Cell Cycle 12.5 (2013): 0-1. Klement, Rainer J., and Ulrike Kämmerer. “Is there a role for carbohydrate restriction in the treatment and prevention of cancer.” Nutrition & metabolism 8.1 (2011): 1-16. Fine, Eugene J., et al. “Targeting insulin inhibition as a metabolic therapy in advanced cancer: a pilot safety and feasibility dietary trial in 10 patients.” Nutrition (2012). Paoli, A., et al. “Nutrition and acne: therapeutic potential of ketogenic diets.” Skin pharmacology and physiology 25.3 (2012): 111-117. Westman, Eric C., et al. “Effect of 6-month adherence to a very low carbohydrate diet program.” The American journal of medicine 113.1 (2002): 30-36. Freeman, John M., Eric H. Kossoff, and Adam L. Hartman. “The ketogenic diet: one decade later.” Pediatrics 119.3 (2007): 535-543. Paoli, Antonio, et al. “Ketogenic diet does not affect strength performance in elite artistic gymnasts.” Journal of the International Society of Sports Nutrition9.1 (2012): 34. Mady, Mackenzie A., et al. “The ketogenic diet: adolescents can do it, too.” Epilepsia 44.6 (2003): 847-851. Bertoli, Simona, et al. “Long-term effects of a ketogenic diet on body composition and bone mineralization in GLUT-1 deficiency syndrome: a case series.” Nutrition 30.6 (2014): 726-728. Chapman, John. “Specialty practice series: Hair loss: Getting to the root of the problem.” AJP: The Australian Journal of Pharmacy 94.1118 (2013): 70. Brinkworth, Grant D., et al. “Long-term effects of a very low-carbohydrate diet and a low-fat diet on mood and cognitive function.” Archives of internal medicine 169.20 (2009): 1873-1880. Rho, Jong M., and Michael A. Rogawski. “The ketogenic diet: stoking the powerhouse of the cell.” Epilepsy Currents 7.2 (2007): 58. Noh, Hae Sook, et al. “A cDNA microarray analysis of gene expression profiles in rat hippocampus following a ketogenic diet.” Molecular brain research 129.1 (2004): 80-87. Astrup, Arne, Thomas Meinert Larsen, and Angela Harper. “Atkins and other low-carbohydrate diets: hoax or an effective tool for weight loss?.” The Lancet 364.9437 (2004): 897-899. Erlanson-Albertsson, Charlotte, and Jie Mei. “The effect of low carbohydrate on energy metabolism.” International Journal of Obesity 29 (2005): S26-S30. Boden, Guenther, et al. “Effect of a low-carbohydrate diet on appetite, blood glucose levels, and insulin resistance in obese patients with type 2 diabetes.” Annals of internal medicine 142.6 (2005): 403-411. Sumithran, P., et al. “Ketosis and appetite-mediating nutrients and hormones after weight loss.” European journal of clinical nutrition 67.7 (2013): 759-764. Rolls, Barbara J. “The role of energy density in the overconsumption of fat.” The Journal of nutrition 130.2 (2000): 268S-271S. coverage! Keep up the fantastic works guys I’ve incorporated you guys to my personal blogroll. NutrientJournal.com provides accurate and independent information on potential sport enhancing nutrients. All information provided on the site is for educational purposes only and is not to be used for medical advice, diagnosis or treatment. Copyright © 2013-2017 Nutrient Journal - All rights reserved.